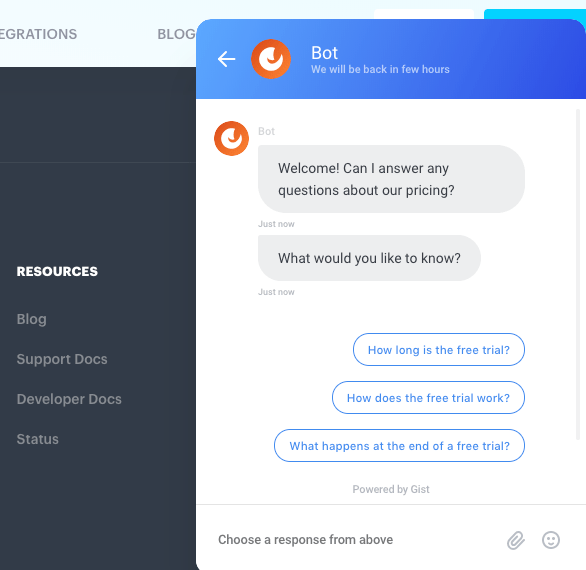 Intercom focuses on live chat and bot creation and they do it well. At Gist, live chat is one of our front-facing features. Functionally speaking, both live chat features are very similar. 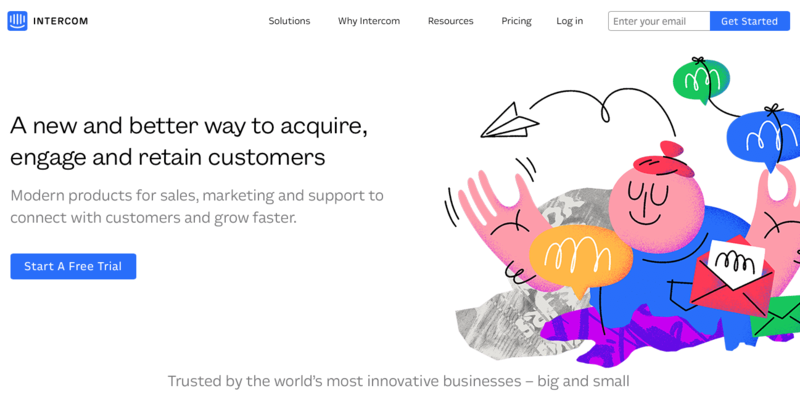 Given their focus, Intercom has an incredibly intuitive and visually-appealing design for visitors. In addition to this, there is a well-designed dashboard for users. A potential drawback is the pricing model. If you have over 200 “active people” per month, the cost begins to climb. Gist’s recent redesign gave us a big step forward to streamline viewing messages and interacting with customers. Unlimited chat interactions per month for one flat fee is a perk that helps us stand out here. 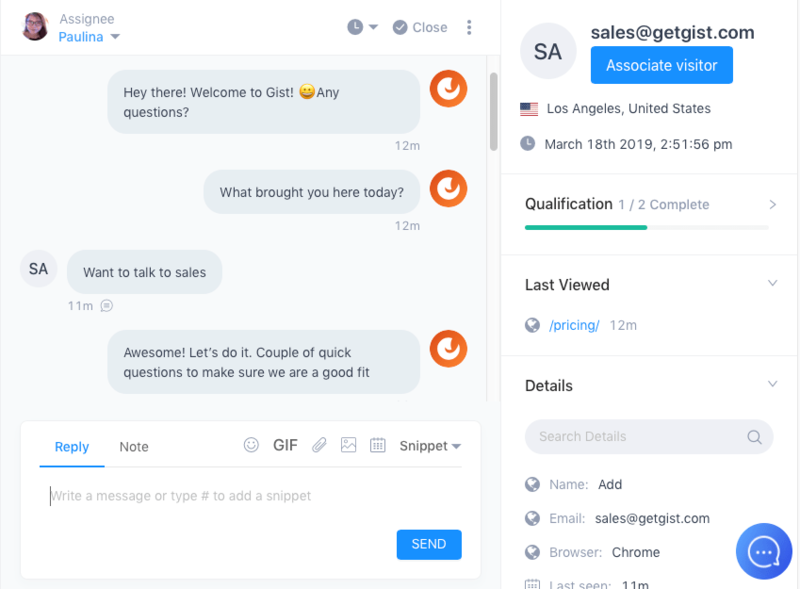 If you’re simply looking for a live chat, chat bot solution and don’t need the additional functionality offered by Gist, Intercom is going to beat us here. Having a customer support feature is a natural progression for live chat apps. Both Intercom and Gist have a help desk that directly integrates with chat functionality. And much like live chat, both are functionally similar. In terms of differences, Intercom has reporting capability allowing users to see certain metrics, like response time. Gist’s strength is our additional email marketing functionality. Instead of having to integrate with another tool (like you would with Intercom), you can simply send emails to your support users. Emailing can also be done via automations to make it a scalable post-support option. We’ll give this victory to Gist, given the deep-seated connection between customer support and email. Intercom offers a great deal of integrations, but having an email tool hooked right up to your support system is highly valuable. 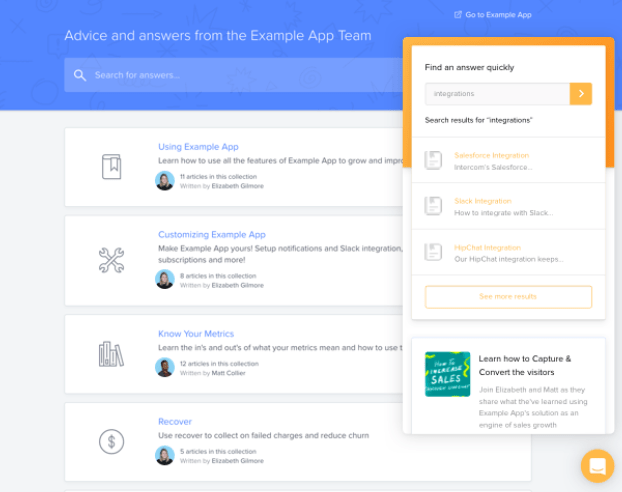 Both Gist and Intercom offer a knowledge base solution to help your current and potential customer learn more about your products and services. Two difference give Intercom the edge in terms of this tool. While you can create a customer support bot and insert articles with relative ease with Gist, it’s not as intuitive as Intercom’s setup. With the ability to automatically move your articles from other KB’s, like Zendesk. And the deeper integration with bots — We’ve got to give this one to Intercom. Chat bots are another tool offered by both Gist and Intercom. It’s also another tool with a surprising number of similarities. In fact, bots are probably the most equal comparison between both companies. Sure, there are differences, but the strengths and weaknesses bring things to a virtual tie. The ability to integrate the knowledge base (another Intercom product) directly with bots to alleviate support burden. Gist allows you to create a support bot, but Intercom has the ability to directly embed knowledge base articles into a bot. In addition, our bot creator is a simple, yet effective linear design. While these differences are notable, the price brings us back to even. Custom bots from Intercom is only available on their “Premium” plan which doesn’t list an actual price. You can purchase and “add-on” for custom bots, but this feature is $99/mo. This add-on is more than Gist’s highest price plan at $79/mo, which includes everything Gist has to offer. You do get some bots on lower-cost plans. All of the bot functions on lower plans (i.e. lead qualification bots) are virtually the same for both companies. Gist edges out Intercom on chat bots for a couple of key reasons. Price. The ability to create and use custom bots costs an additional $99/mo. Gist has a plan that includes everything for one monthly cost. No other key differences. While the visual builder is cool, it’s not a big enough differentiator given the other factors. Intercom offers over 100 integrations, including popular meeting schedulers in most of their plans. That said, they don’t have a native tool for scheduling meetings. Gist’s meeting scheduler tool allows you to hook up your Google Calendar and create a custom link to send to prospects, current customers and just about anyone else who wants a meeting. 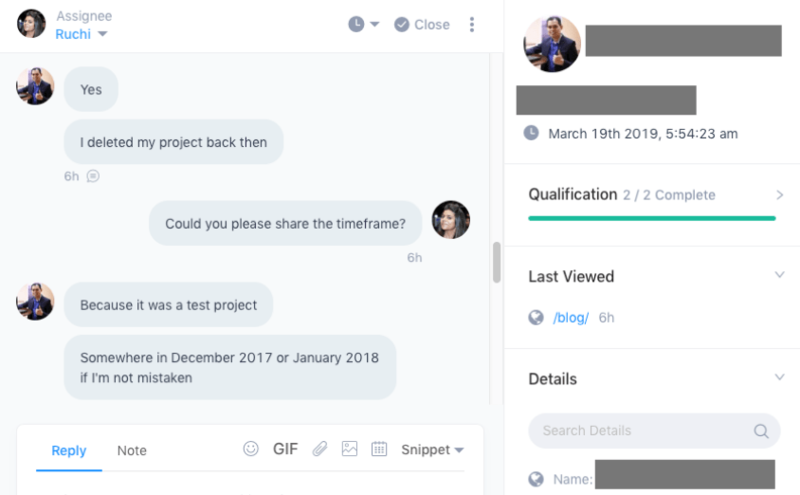 An awesome benefit of using Gist is the ability to view all of your live chat, chat bot email and meetings from one dashboard, all created by the same team of developers. Since Intercom doesn’t have a native scheduler, we’ll give this one to Gist. Technically, Intercom doesn’t have an email marketing tool — in the typical sense. You can email contacts in your intercom account (provided you have their email). But it’s not in a broadcast or drip campaign. Rather, they allow you to add email to your chat and messaging efforts. Don’t get me wrong, it’s cool. You can have a live chat, then send an email message and even a notification to one contact, really helping close a sale. But it’s not a list-building, lead nurturing tool that is scalable. It can get pricey, but if you have a team of SDRs who are able to create messages and really get the most out of the email addition, Intercom could be useful. 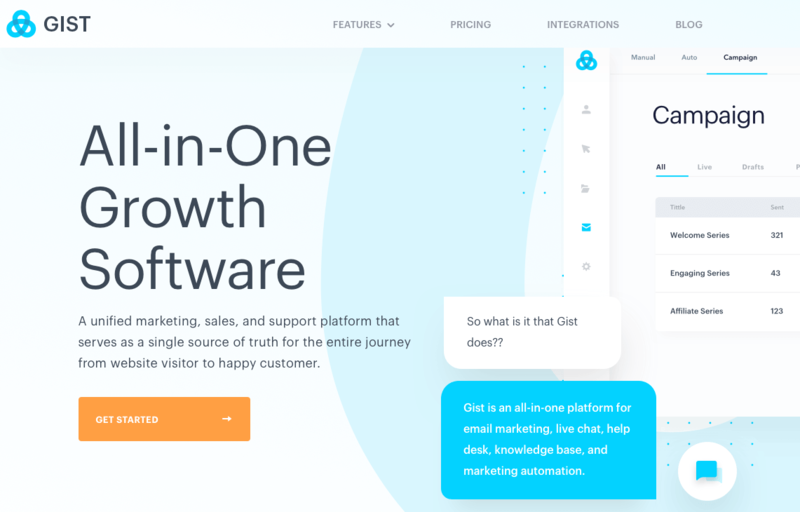 However, Gist offers a full email marketing tool to help you grow and nurture your list with drip campaigns and many other features (including a visual builder coming soon). Intercom doesn’t offer a specific tool labeled “marketing automations”. However, they do have something called “targeted messages” and also “smart campaigns”. Essentially, they’re both like a drip campaign with the ability to automate messages, in-app notifications and even emails to your customers and leads. Since it’s not just a bot or email tool, I included it in this section. 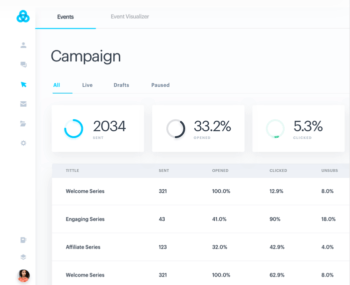 Gist offers marketing automation capabilities which give users the ability to create tags based off of a host of events and then set up and trigger a large number of actions based on those triggers. 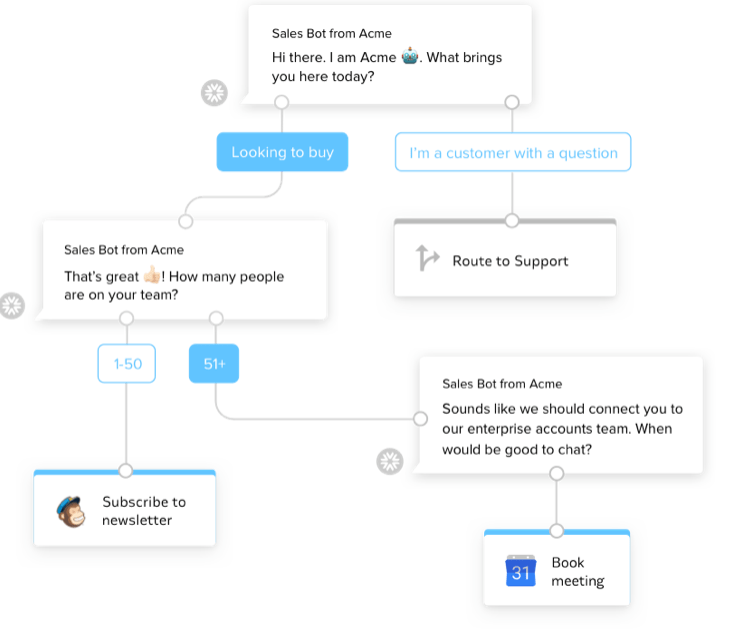 What Intercom does have is cool, but it’s not full-on marketing automation. Gist’s automation capability gives users the ability to gel all of our tools together and make them a true all-in-one solution. Browser and in-app notifications are something Gist doesn’t offer yet, but we do plan on offering it very soon. 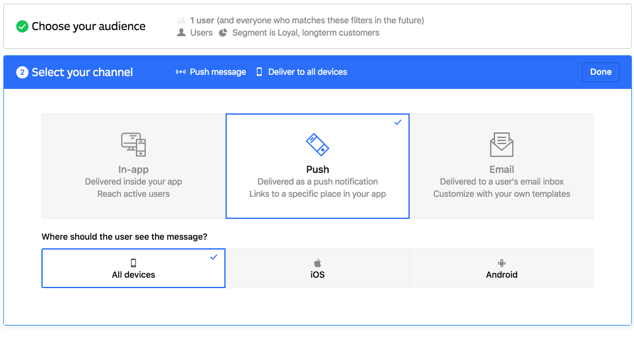 Intercom does offer push notifications and other tools to help better alert users, visitors and customers. Until Gist has our notification feature up and running, we absolutely have to give this one to Intercom. This ability isn’t just for those who have subscribed. Our event tracking pulls information which identifies and tracks visitors from just about anywhere. Intercom doesn’t offer event tracking at this time. 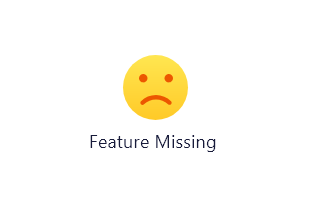 Gotta give this one to Gist since Intercom doesn’t have a viable feature to compare. Forms offer the ability to collect contact data from site visitors. The most common form of data collected would be email addresses, followed by first name. Intercom doesn’t offer forms to collect data, since they don’t have an email marketing feature. Not only that, you can pair our automation capabilities to deliver lead magnets, start a drip campaign and much more. Gist is the winner since there isn’t a similar feature to compare from Intercom. 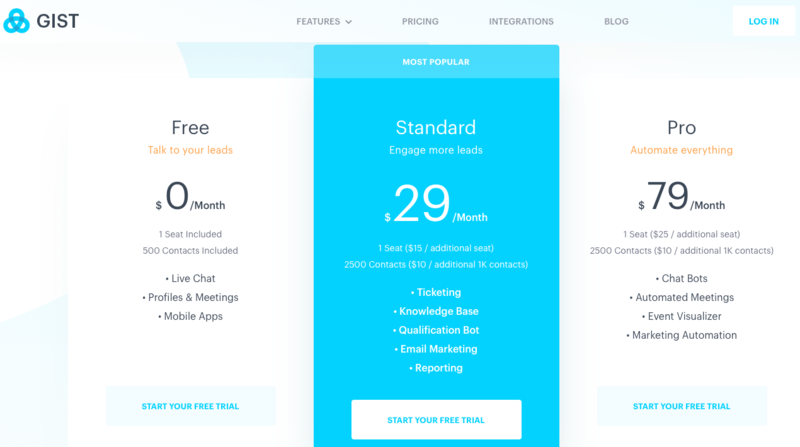 There are several difference between Intercom and Gist when it comes to pricing. Here are notable points about Gist. Gist offers a 21-day free trial, moving into a free plan. Gist’s Standard plan is $29/mo and includes most, yet not all of those features. The Pro plan is $79/mo. It includes every feature available on our All-in-One platform. Additional seats cost $15/mo for Standard and $25/mo for Pro. And some points about Intercom’s pricing. Intercom has 12 different plans across 4 different types of plan. There are also 3 different “Premium” plans which do not list pricing on the site. Additional seats range in cost from $19/mo to $39/mo, but additional “Premium” plan seat pricing is not listed. Intercom has Gist on several features. That said, the power of the all-in-one and the value of our pricing make Gist the no-contest winner in terms of cost. Intercom does live chat really well. They have a cool bot creator. And their features work really well together giving you to ability to automate and speak to site visitors super effectively. On the downside, they don’t include custom bots into their plans (at least not the ones they show you on their pricing page). And $99/mo for custom bots is more than Gist charges for our most expensive plan. Gist is still furiously working to improve all of our current features while introducing many more useful marketing, sales and support tools. Not only is the future bright and the price affordable, but our current product is still more powerful than Intercom. Gist wins for a few different reasons. 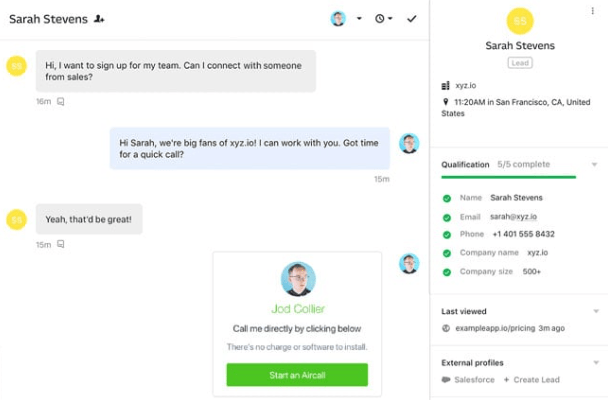 All-in-One: Intercom positions itself as a solution to “acquire, engage and support” customers. They certainly deliver to an extent, but Gist is a more robust and comprehensive tool offering coverage for the entire buyer journey. Affordability: Our cost is much lower than Intercom’s and it includes more features on every level. This affordability makes us the clear advantage in terms of cost. Future Possibility: Not only is Gist looking to deepen the usability of our current tools, we are also currently building new features to truly embrace the all-in-one category. Interested in switching from Intercom to Gist? Here’s a guide for migrating specifically from Intercom.